Tooth brushing for professionals – Weltherz e.V. During my stay with Joseph, Sarah and the children of the Hope Home in January 2018, I quickly realized that the majority of the population was little or wrongly informed about the topics of daily hygiene and medicine. This concerns, for example, the handling of fever in small children and the treatment of small wounds and injuries, where not only the necessary material for simple treatment is lacking, but also the knowledge about the correct handling of it. But even in elementary dental and oral care there are large gaps in knowledge. And so it is not surprising that Tanzanians suffer from the poor condition of their teeth from childhood and adolescence up to the loss of a large part of them. The regular consumption of extremely sugary lemonades also makes a decisive contribution. 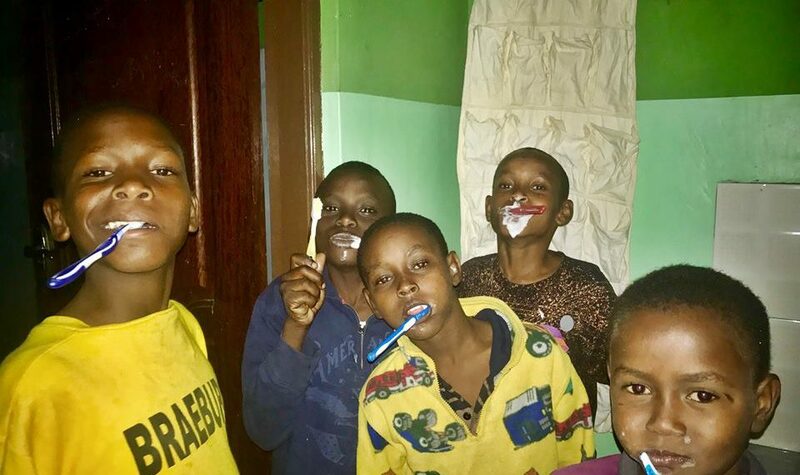 Even though Sarah, Joseph and the children of the Hope Home were equipped with enough toothbrushes and toothpaste, they have not known what a good dental care should look like until now. I took this as an opportunity to sensitize Sarah and Joseph, and especially the children themselves, during my stay for consistent dental care and to develop a tooth brushing routine with them. Eagerly and enthusiastically, they had me explain to them – something they had never known before – that teeth are brushed twice a day for at least two minutes, that they are not allowed to eat meals or drink sweetened drinks in the evening after brushing their teeth and how they should hold the toothbrush and run it over their teeth. The children made sure that nobody ignored my “instructions” and so we all stood in front of a small washbasin every evening to brush our teeth together. Let’s hope that this enthusiasm will continue for a long time to come.